In our new house, we have a small fourth bedroom that we had called "The Domestic Office," "Utility Room," "Craft Room," etc... before I gave it a face lift, it was a sort of catch all room. It was the place everything landed (especially after I fixed up the guest room) - cleaning supplies, kitchen overflow, laundry, ironing, crafting materials, gift wrap, recycling and whatever else didn't have a proper home. I wanted to transform the space into somewhat of a "work room" or "office" for me. But, an "office" for me is much different than an "office" for most people. It must have counter space, storage, good lighting, and inspire me to create. I need a space I can go into and feel like I have everything I need to do whatever I need to do. For me, it must be a functional and beautiful space. 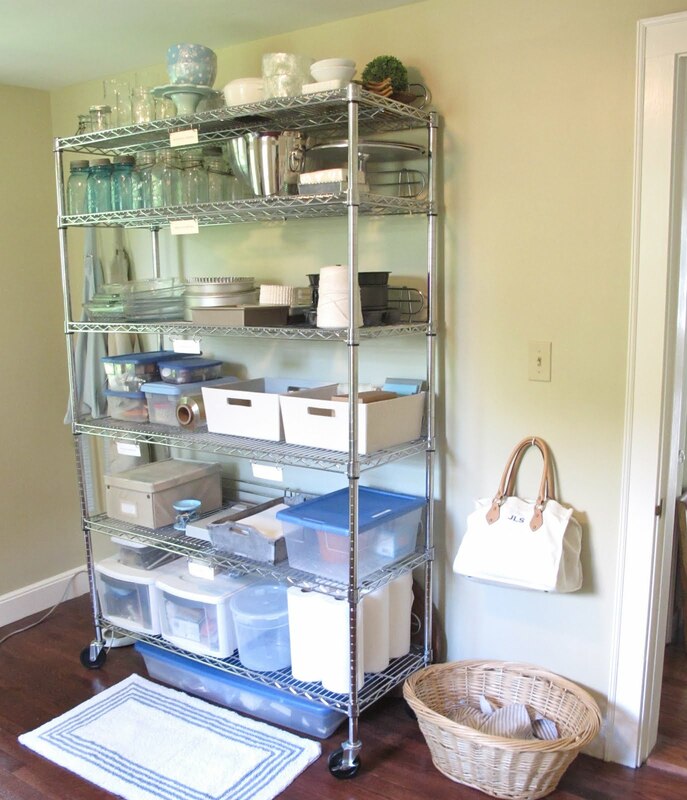 I used to flip through Martha's, "Good Things for Organizing," and dream about the perfect house I would have someday, with the perfect organized laundry room, the neatest closets, and a bright efficient work room... Well, I have a little issue with waiting for things to happen for me. I don't. I want a beautiful, organized work space/office/laundry room today - in this house - right now. So I made one. I turned a storage room into a great space for me to be creative in. I'm not a natural born neat freak - actually, I'm not very neat at all. I can turn a kitchen upside down in 10 minutes - it can get pretty crazy around here. So, I have to make an exaggerated effort to attempt to be neat for my very neat husband - and it feels good to walk into a super organized room. It gives me a "blank slate" feeling that kick-starts my creativity. 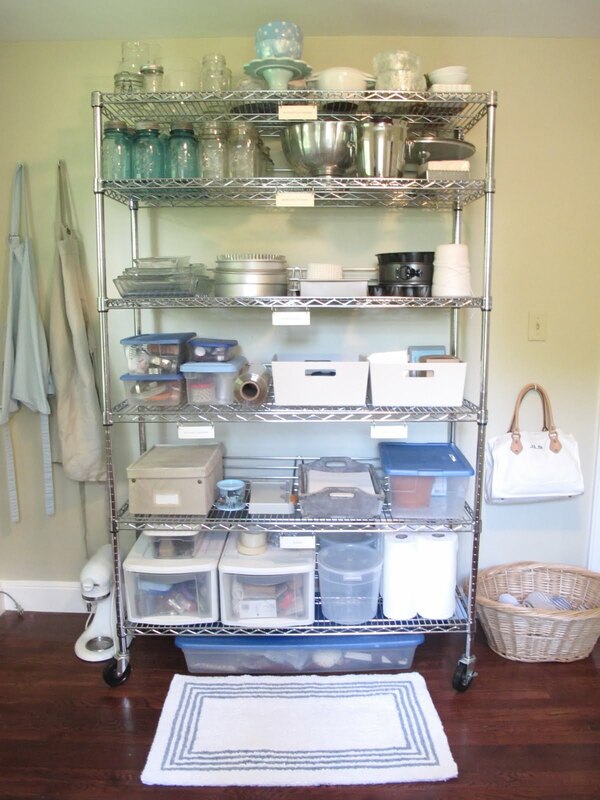 I have loved this craft armoire for years... maybe someday I'll trade in my stainless steel shelves (you can buy them here!) for a painted armoire. cooking twine, cookie decorating supplies, packaging materials, ribbons, paper supplies, fabric swatches, drawers of crafting supplies, extra drum containers, paper towels and rolls of gift wrap in the bin underneath. Here is a link to the shelves - they are a great investment! These fabric boxes ($6.99 from target) contain all of the materials I need to wrap up little presents and baked goods : Paper-Source satin ribbon, natural twine, clear cellophane bags, envelopes, and kraft paper boxes. I made the labels on my computer, printed them on cardstock (order here from Paper-Source), then attached them to the shelf with binder rings. Now when someone else puts things away, they have a better chance of getting it in the right spot. Hopefully. To the right, I keep a basket for our cloth napkins and kitchen towels. On the other side of the room, the cleaning supplies hides in the closet. These cork boards have gone through their own inspiring transformation - they used to be a dark grey, but with a new coat of white they look fresh and new. I am really looking forward to being able to find scissors, my girly hammer, a sharpie, and tape whenever I need it. I hung them all in place using hooks and clear push pins. I have all of the linens and extra towels, folded on the top shelf. The vacuum cleaner and carpet shampooer fit in perfectly. I hung our dust mop, mop, and broom from hooks to keep them from falling all over each other and out of the closet... which is what they were doing before. And yet, the other side of the room is where my work table, hanging rack, ironing board live. I like that the desk sits in front of a sunny window. Did you notice the stool? That is my favorite $19 purchase of all time... the rolling, goes up, goes down, stainless steel stool! 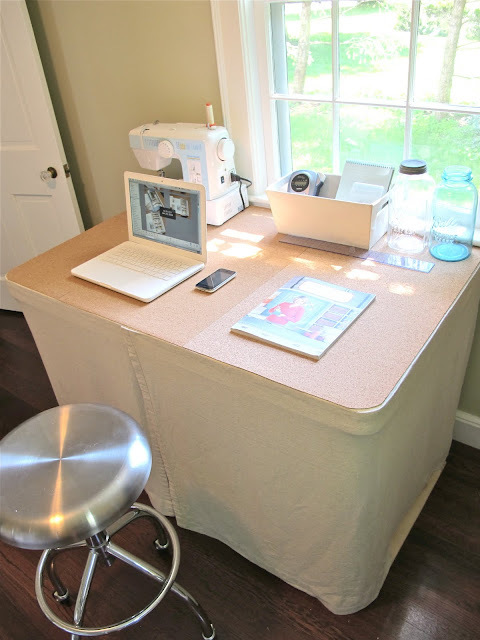 This worktable is actually a folding table that I hot glued a linen skirt onto that was made from my old oatmeal linen drapes. Did I mention this was a low budget project? I put this self-adhesive cork lining on the top of the table to create a durable work surface. I love this stuff. I line all of my cabinets with it (remember it in our DIY kitchen island?). I holds up very nicely to abuse - and I think it is pretty. Oh my. I have an old armoire that I've been trying to get rid of that you can HAVE! I swear the next time I come home to Boston, I'd be happy to load it into our Pilot. Not being very crafty myself, I am not interested in sanding or painting it. I've been trying to sell it on Craigslist for 2 years. I love this room! You've done such a great job transforming this into a cute AND useable workspace. Side note - i really love your monogrammed bag.... where did you get it!? Can you please tell me where the monogrammed tote came from? I'm looking for one just like it! Looks great- very inspiring! What font did you use for the labels? Love Paper source! the cleaning lady has been here and everything sparkles and smells good!